You may not have heard of Chip Douche (doo-SHAY) but we think you'll enjoy getting to know him. In the second installment, we get to know him a little better, as he refers to himself as the "Chipster." 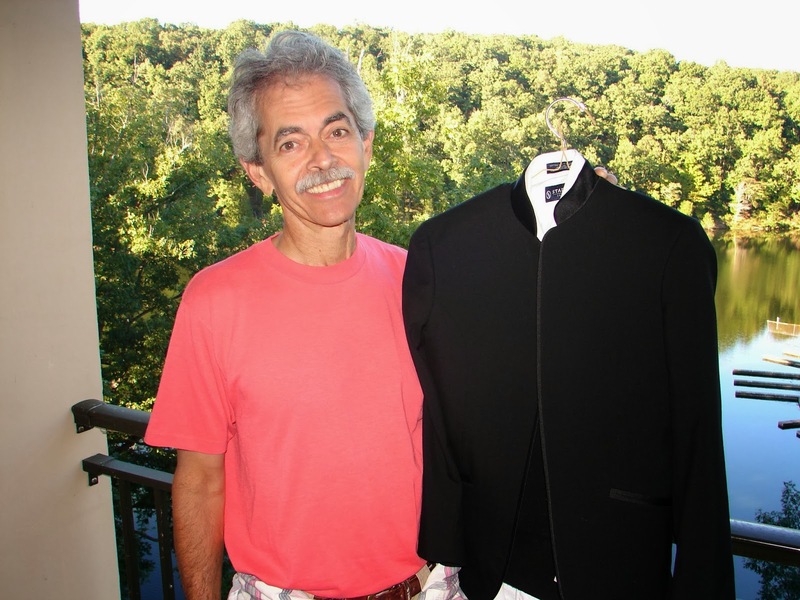 Chip is the brainchild of a creative advertising entrepreneur and Belmont music biz professor named Mike Cortese. He and his partner Ryan Bitzer have launched an innovative marketing campaign producing funny videos as a way to attract viewers. Edgehill Cafe is their first client. 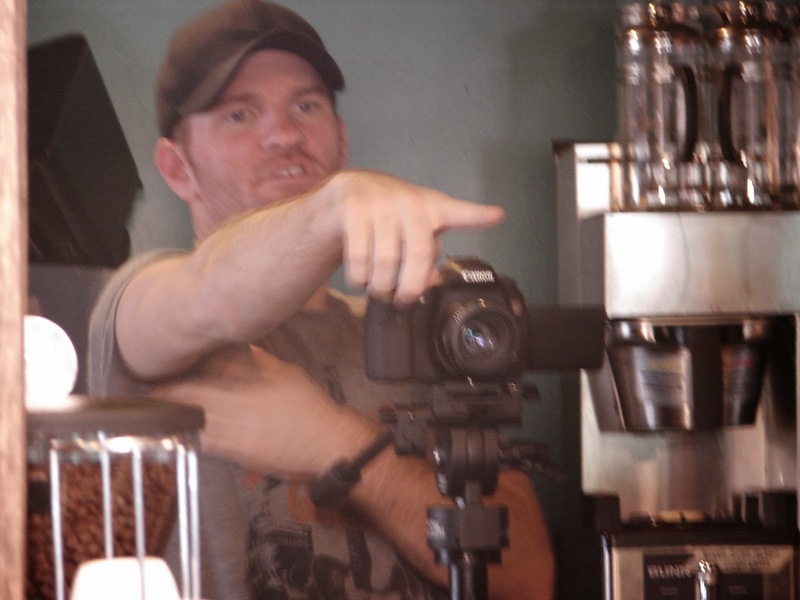 Mike's extensive background in improvisational comedy was the perfect match for the situation. Watching Chip is like watching a sketch on Saturday Night Live or SCTV. In another recent video, he plays an obnoxious talk show journalist, with a fake tan, interviewing author Ruta Sepetys, winner of a recent Quill Award. Ruta Sepetys is a real author, who played along with the spoof, while still talking intelligently about her book and thanking her publisher. 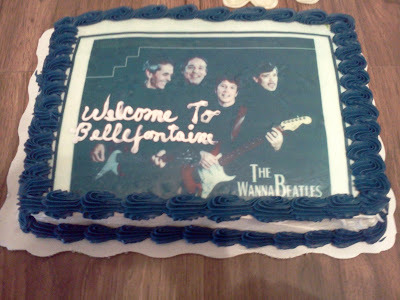 So what could this possibly have to do with The WannaBeatles? You might well arsk. The third Edgehill spot is a sketch where different coffee drinks are ordered. One of them is called the Abbey Road. Mike and Ryan thought having a locally known Beatles band would work in that scene. It was about a month ago when we heard from them about the possibility of our appearing in the video, as the customers who order the "Abbey Road." After watching the Chip Douche videos, we were drawn in, and thought that sounded like fun. It took some juggling to find a day when we were all available to do it, but Mike and his videographer and all four of us were available last Sunday, Sept. 22, at 1 pm. We got into uniform and brought our guitars, bass and drum sticks to the Edgehill. The script has the barista call out the order, "Four Abbey Roads!" 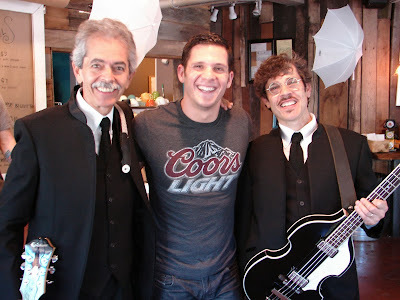 then he looks in our direction, with a vague sense of recognition, saying "hey, isn't that…" The next shot is us, in uniform, holding our guitars, bass and drum sticks, saying "Hello, we're The WannaBeatles," then coming up to the bar to get our drinks. We were there to do our scene - that one line. No one else was there. Not the barista who offers us the drinks. In fact, there were no "Abbey Road" drinks in the room. They weren't even on the menu. Hard to believe, I know. The rest of the video has already been shot. Like a film, this video was being assembled in pieces, a few seconds of screen time taking many minutes of shooting time, and most scenes shot days apart. It's the editing that makes it all seem like one seamless event to the viewer. Mike gave us our cue, and held a small recorder to capture the sound, while Thomas Newton, his videographer, captured the shot. We sat on four adjacent stools and said our line, and walked toward the camera, supposedly to pick up our coffee drinks. We tried several times to get it just right. After they got a take we all liked, we gave them a special rendition of "Yeah, yeah, yeah" in harmony, which they may insert among the outtakes at the end -- we'll see. We were glad to hang out with Mike and Thomas after the scene. That particular Sunday, both Dennis and I were leaving town - him for Florida to visit his parents, me with the Good Yoko to a state park for a one night escape. Dennis had to leave for the airport right after our video shoot, and he didn't want to take his WannaBeatles outfit to Florida, so we took it with us. Good Yoko thought it was be funny to take some photos of Dennis's suit on vacation with us. Dennis's suit on the balcony, with a view of the lake. 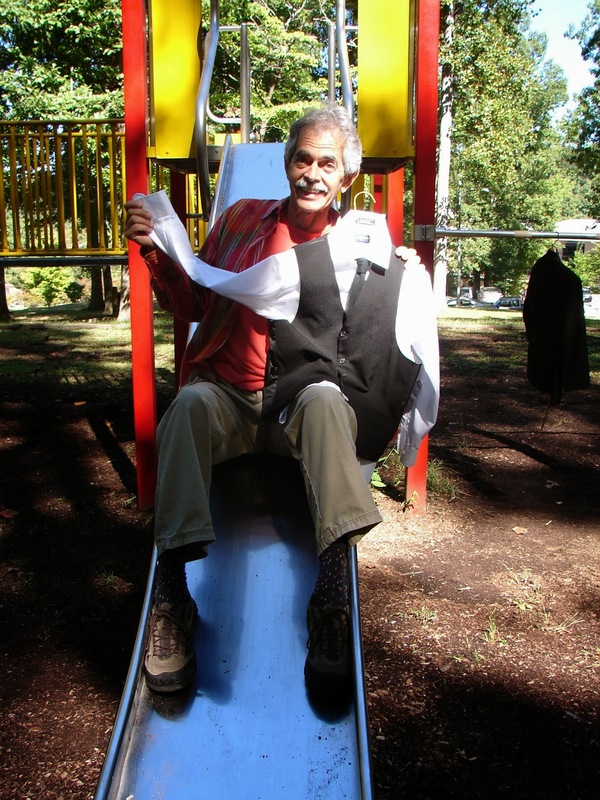 Dennis's suit at the playground, trying out the slide. We hope his suit enjoyed the vacation. Dennis certainly deserves it. Thanks to Good Yoko for all the photos. Thanks to Mike, Ryan and Thomas for adding us to their video. We look forward to seeing it. And trying our first real "Abbey Road" at Edgehill Cafe. Most of you know that The WannaBeatles have a drummer who was born in Cuba. This means David Toledo speaks Spanish perfectly well, which also means we have a great opportunity to reach the Hispanic community. As this blog has indicated, we see ourselves a global group. (see previous blogs about "going global.") But making that a reality means taking a practical step to reach out to the rest of the world. Taking advantage of our built-in bilingual resource is our first step on the path of least resistance. One thing we've tried before is translating Beatles songs into Spanish. As it turns out, David's dad is a professional translator, having been hired for English and Spanish translation for high level government functions. Reinaldo Toledo is a retired Methodist pastor, and studying different languages was part of his preparation. David took him the lyrics to "Because," and after a few days, Senor Toledo came up with a beautiful version. As most Beatles fans will remember, the first line goes, "Because the world is round, it turns me on." In our Spanish version, that line became "El mundo en su esplendor me inspira mi" which means "The world in its splendor inspires me." That line is a good indication of the difficulty of translating a song. First of all, most English phrases cannot be expressed in Spanish with the same number of syllables. Spanish versions of English words and phrases are usually longer. When a book gets translated from English to Spanish, it can add 20 per cent to the length. A great place to see Spanish and English compared is at Lowe's or Home Depot. All the signs are bilingual, and most cases, the Spanish version of the word is longer. Another challenge is wordplay. John Lennon was making a joke by putting "the world is round" with "turns me on," and there's no equivalent joke in Spanish. What David's dad did was to take the phrase "turns me on," and make it more noble - the splendor of the world inspires me. So what we had with "Because" was a beautiful line, in a beautiful language, with too many syllables. That required squeezing together words with the technique called elision. Because we were restricted by the specific notes of the melody, we had to squeeze the eight syllables of "El mundo en su esplendor" into six notes. The elision turns it into "El Mun - doen sues plen dor" with "doen" and "sues" each being restricted to one syllable each, although they each contain complex diphthongs. Perhaps we're getting too technical here. Suffice it to say singing notes in tune is one job, and learning how to pronounce a language that doesn't quite fit into the pattern of one's native language is another. But we had David to help us, training us to pronounce "doen" and "sues" as if they were one syllable. He assured us that Spanish speaking listeners would know what we were saying. And we went through the entire song that way. And we struggled with the parts for musical reasons apart from the language issue. And we never gained the confidence that we could do it. We rehearsed it repeatedly, and performed it once, at Puckett's in Franklin, and felt we didn't do well enough. That was the last time. That was a few years ago, and we haven't tackled any other Spanish projects. Until recently. We've been working on a version of "If We Simply Love" to be used by Big Brother Big Sister of Middle Tennessee. That's another story unto itself, but for now, what's exciting is the possibility of using a Spanish version of the song. Our friend Todd Wilson at Big Brother Big Sister made a video for the song, with photos of lots of real life Big Brother Big Sister relationships. It's a natural progression that putting out a Spanish version of the video would make sense for the organization to reach its Hispanic audience. They already have a version of their website completely in Spanish. 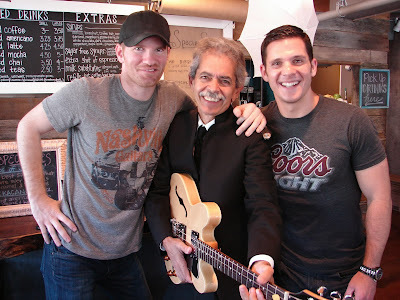 David went back to his dad to get help in translating his song into Spanish. Again, certain English phrases couldn't be translated exactly. But the result was a more beautiful song, not only because of the fluid sound of many Spanish words, but also because seeking ways to convey the meaning led to new ways of expressing the ideas of the song. For example, the chorus has a line "The moment we start to live from the heart." The Spanish version has "Cuando al comenzar A vivir y amar," which means "When we begin to live and to love," which has more weight and drama to it. David said that he had worked with his father on the translation, and that his mother joined in the effort too, so that the result was actually the work of all three of them. For the record, that's David, Maria and Reinaldo Toledo. It felt very appropriate that David had made both his parents part of the process. It emphasizes the organic family nature of what we're doing, in addition to turning out a quality translation as easily as taking a breath. After the new lyrics were written, I spent an afternoon at David's studio helping him record the Spanish vocal on the song. There were a few places where elision was necessary, combining syllables to fit into smaller available space, but most of it fit well with the existing melody. There were several times during the session when David called his dad on the phone, to check on the grammar of a particular phrase. He wanted to add "Yo sey" at the beginning of the second verse, which means "I know." He had to hear from his dad that it would be acceptable. There were other creative moments. 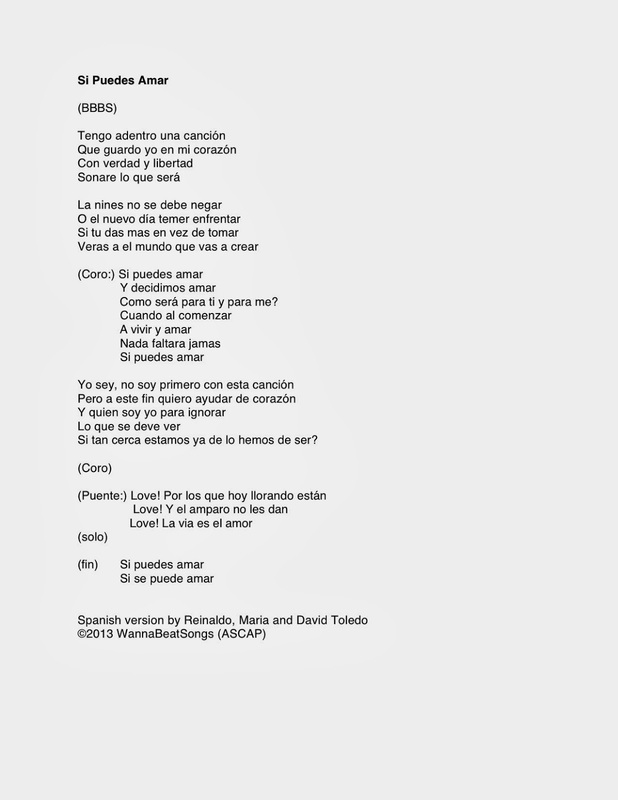 At the very end of the song, David repeats the title, "Si puede amar." "Si" in Spanish means both "if" and "Yes." There's a common expression "Si, se puede," which means "yes we can," or "it can be done." David thought of adding that to the end - playing on the double meaning of "si" to bring in an additional encouraging thought, which adds further drama to the message - an improvement which was only possible because of the way the Spanish language works. We had just finished recording his entire vocal when his wife Alice arrived home after her day of teaching at CPA. We were excited to play it for her. Alice was born in the U.S. to a Puerto Rican mother and bilingual father, so she's completely fluent in Spanish as well. She was able to hear the new song and give it a qualified response. In English, that means "For those who now have been crying/And those who wonder why." What she noticed is that "estén" was somewhat forced, when the verb "estan" would have been a more natural way to say it. ("those who cry" rather than "those who are crying" is a rough translation of the difference.) David saw that the verb had been chosen to rhyme (at least mostly) with the "por que" which concludes the following line. That provoked a brief discussion of lyric options, which led David to consider other lines that might work rhyming with "estan" rather than "estén." He thought of the word "amparo" which means "consolation" and came up with a phrase that works well and rhymes perfectly with "estan:"
"Y el amparo no les dan"
which means "And no consolation is given to them." Amparo is one Spanish word that has fewer syllables than its English translation. David was very happy with the change, since the idea of people being inconsolable had greater emotional depth than people "wondering why." And so, Alice's observation led to a brief rewriting session, which made the song better. In addition to that observation about the lyrics, Alice commented on David's pronunciation. In particular, she said that the word "guardo" (in the second line of the song) should not contain a hard "g" and a strong "r."
To hear her criticize David's pronunciation opened up a new world for me. There are many different ways to pronounce Spanish. Hearing Alice pronounce" guardo," with its softened consonants, sounded elegant and smooth, while her caricature of David's pronunciation sounded more like Rocky Balboa in the 'hood. David took her advice, and we recorded that line over again, with David incorporating Alice's suggestions, and improving his vocal. We don't yet have a final version of the song to play for you, nor of the video. But we do have the lyrics ready for you to read, complete with the latest improvement based on Alice's feedback. And so, I had entered the Toledo home, and watched a family process produce a beautiful version of a new WannaBeatles song. I gained a new respect for Reinaldo and Maria Toledo, for raising their son David, and a new respect for Alice, who helps David learn how to pronounce his native language when none of the rest of us have any clue. It gave me a new appreciation for the Hispanic community, and the fact that this country is such a great place to live, and to fulfill one's talents and abilities. There's so much here that we take for granted. It helps me realize how valuable our freedom is to work with David, and to get to know the Toledos. 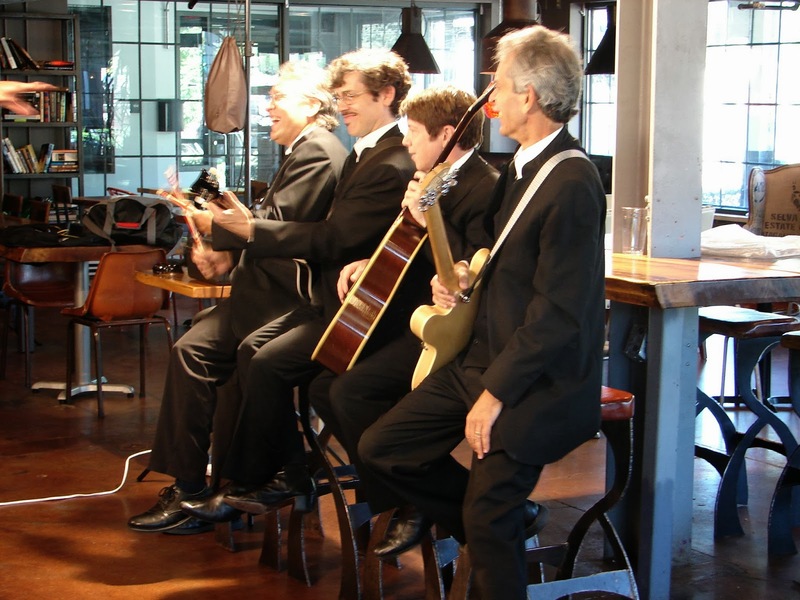 It's an important part of who The WannaBeatles are, and how we reach the rest of the world. 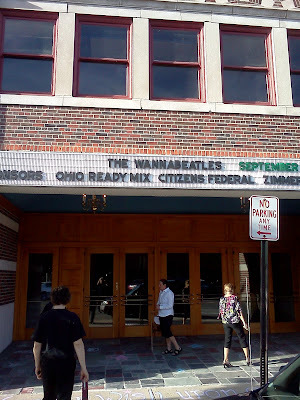 The WannaBeatles went up to Ohio and played a couple of fun gigs. One of them has been planned for almost two years. 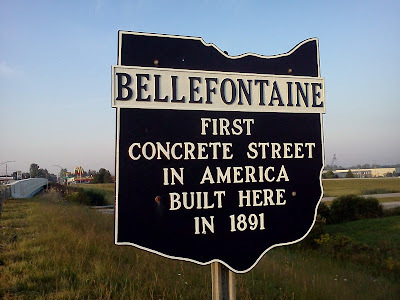 Bellefountaine, Ohio is the home of the former Miss Lori Jenkins, who is now Mrs. Dennis Scott, which makes her a wife of supreme importance to the group. Lori's mom and aunt have visited Nashville and become WannaBeatles fans. We were tickled to hear a couple of years ago that Lori's mom got her picture in a local paper wearing a WannaBeatles tee shirt - the first one in Ohio. So the group has fans up there, and that's why playing there was an event. The local paper published a front page article to show how excited they were to see us. 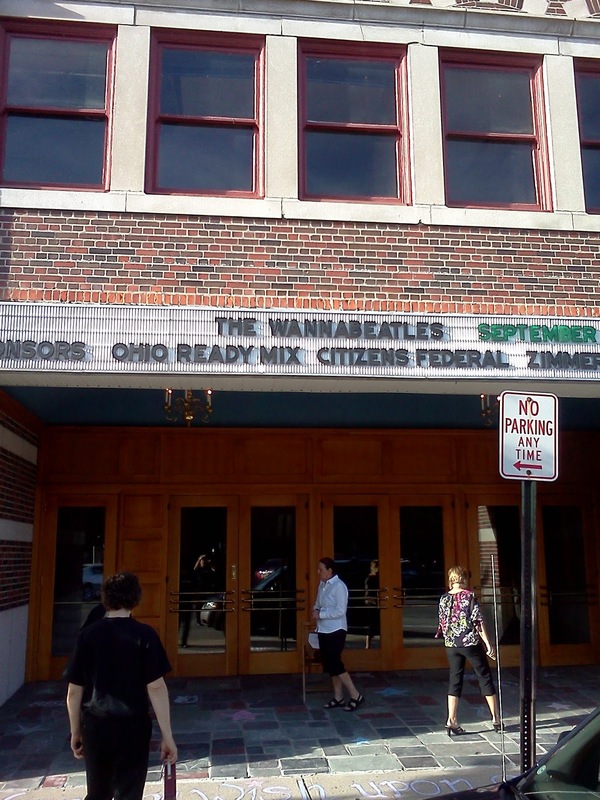 Our gig was at the historic Holland Theater downtown. 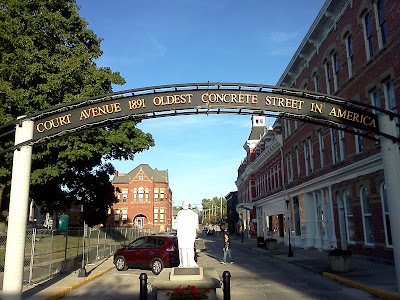 At this point, we've played a variety of such places, in many small to medium sized towns, and we always appreciate the way they bring a community together in appreciating an architectural treasure from a distant period, and making it a viable center for creative expression. But the Holland Theater turned out to be even more special than other restored theaters. It was designed by a Dutch architect and built in 1931. The interior reproduces a typical street from a town in Holland. We're talking about windows, lamps, awnings, brick facades (actually plaster painted to look like bricks) and, on both sides of the auditorium, full scale, operating windmills. All of this was visible to us on the Friday night before the show, after we arrived in Bellefountaine and did a brief performance (unplugged) on the stage of the theater for various supporters who've been involved in the restoration. The windmills were started up, and the blades began to rotate. The special star lights in the ceiling were displayed, along with the image of clouds, moving slowly across the sky. It was all very remarkable, and we can understand why people there were excited about their local theater. 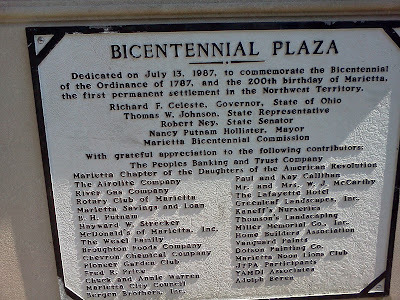 Walking around downtown, we got to see some historic items. Lori and her mom Barb, and her other aunts, brothers and cousins, were all part of making us feel welcome. We were each presented with goodie bags, containing snacks and Ohio souvenirs. We spent Friday night at Lori's mom's house, meeting the family and enjoying a generous cookout supper. They even made a cake with our picture on it, another first. 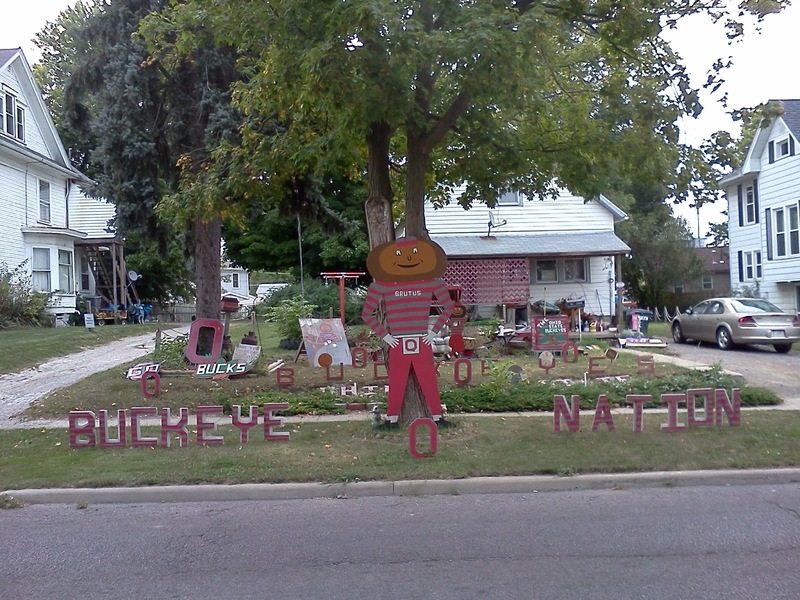 Saturday morning, I took a walk and captured some local flavor in the neighborhood - a combination of Halloween decorations with football fan fever. 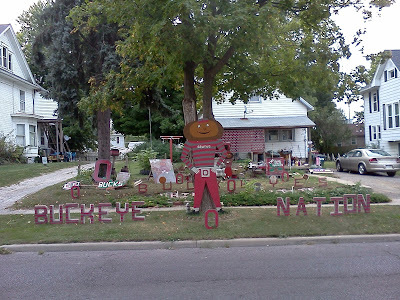 This particular home identifies itself as "Buckeye Nation." We had a great breakfast at a favorite local restaurant, where we saw some of Lori's cousins again. It turned out that our waitress was also the director of the local dance studio, Dance Fusion Studio, which was involved in our show. We would be rehearsing their two numbers at the theater that afternoon, and performing with them that night. The show went well. We had an excellent sound man, Quentin, and a huge video screen covering the back of the stage. We could tell that Dennis was a little nervous, playing in front of his wife's enthusiastic home town, but he did well. 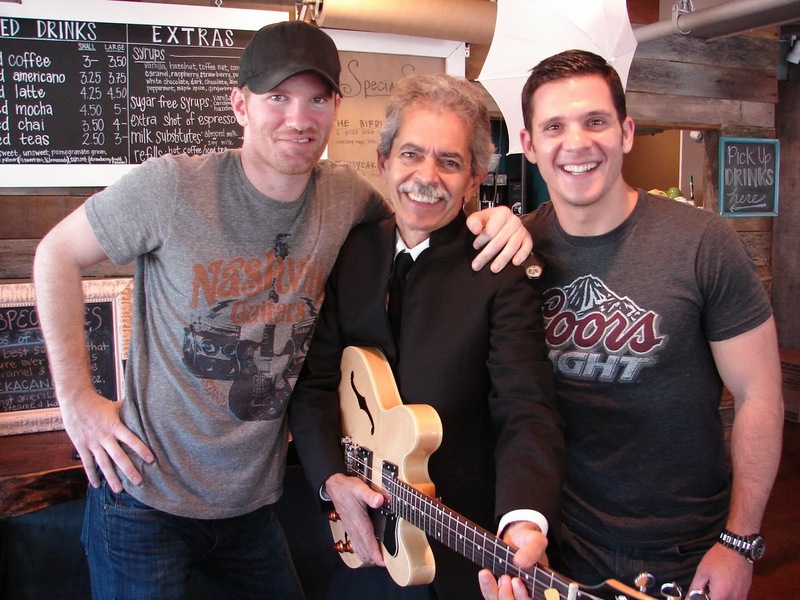 He made a comment onstage about his mother in law visiting their Nashville home for six months. LIke a great Jewish comedian, he paused a few seconds, then said "That wouldn't be so bad, but she also brings her sister Patty." He was complaining, but making a classic joke out of it, and the people laughed. He had them in the palm of his hand after that, and we had a great show. 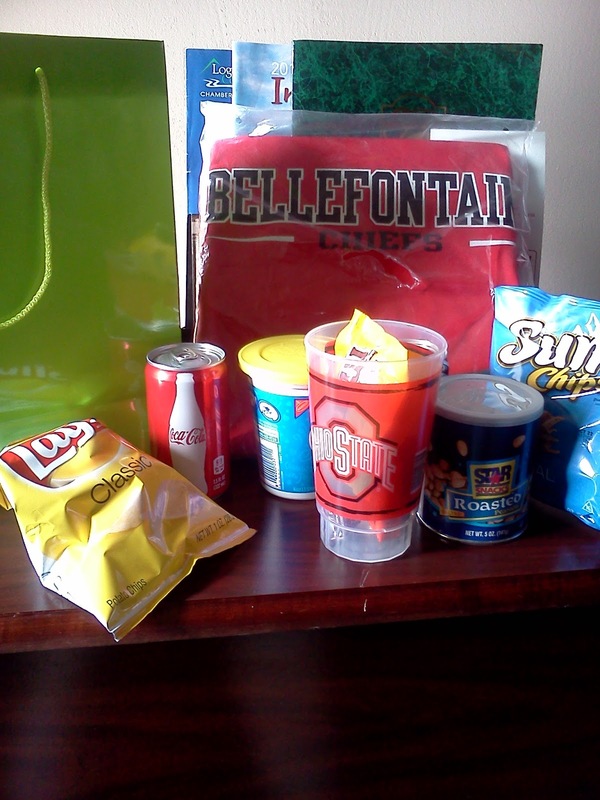 Sunday morning we learned a little more about what makes Bellefountaine special. 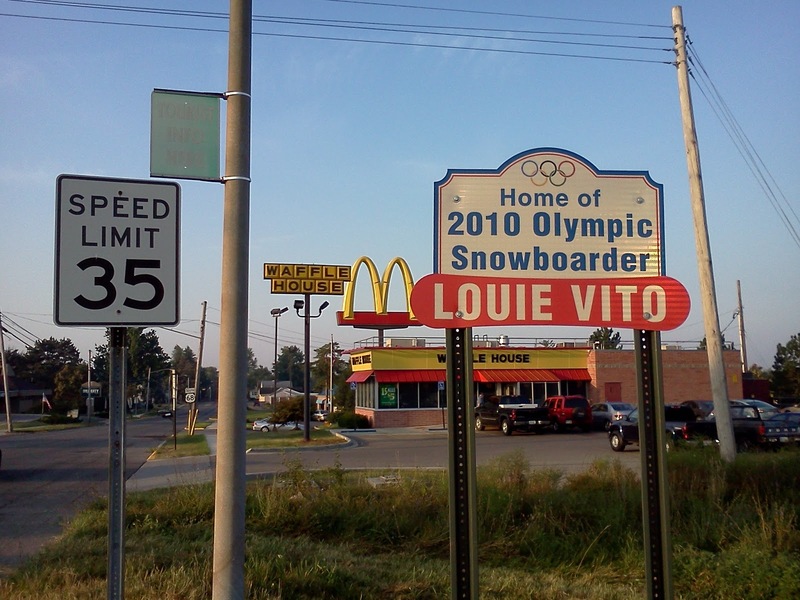 It's in Logan County, which contains the highest point in Ohio. It's the home of Betty White's first husband. 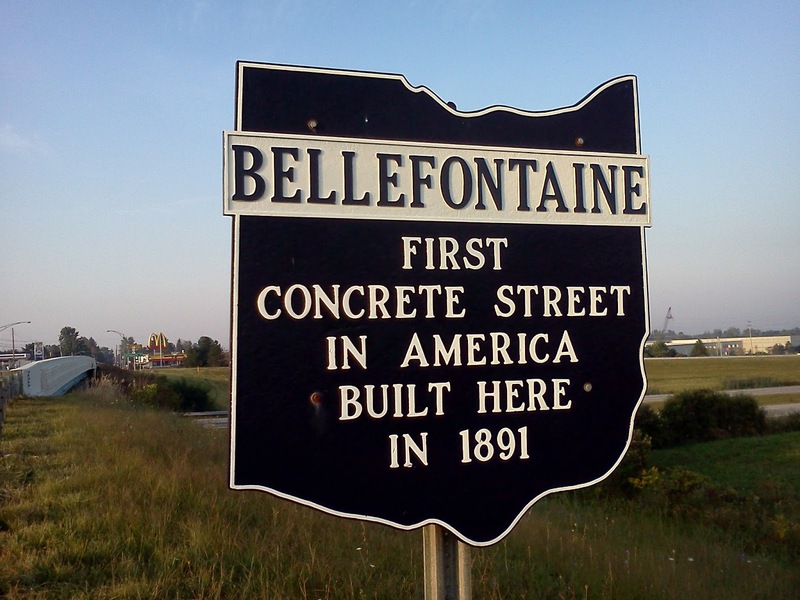 But the greatest claim they make is having the first concrete street in America. Then we drove to Marietta, in the southeast corner of the state, on the Ohio River. 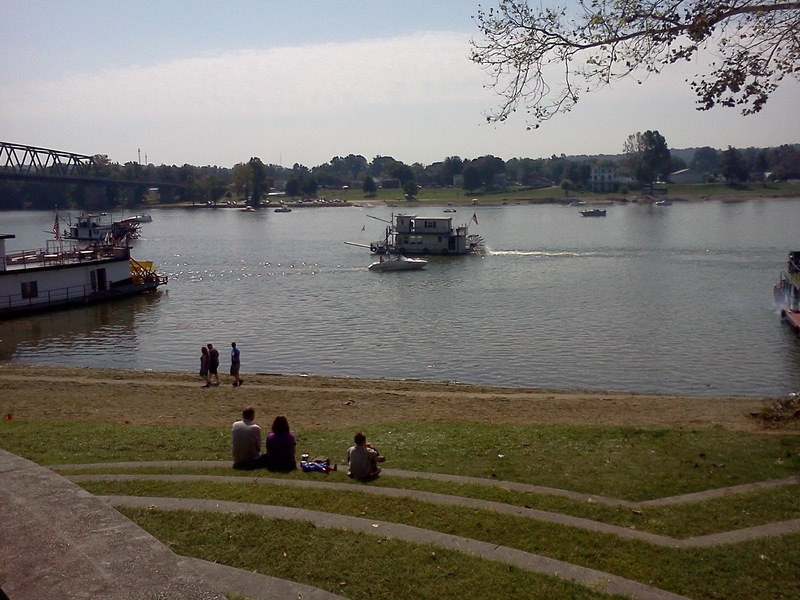 We were booked as the closing act for the annual Sternwheel Festival, which features steamboat races at the riverfront. The bands played on a barge that was attached to the riverbank, much like we had experienced in Nashville at River Front Park. 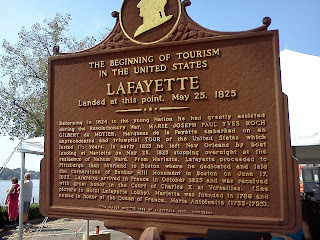 We had a room at the Layette Hotel downtown, and learned about Lafayette's visit there in 1825. 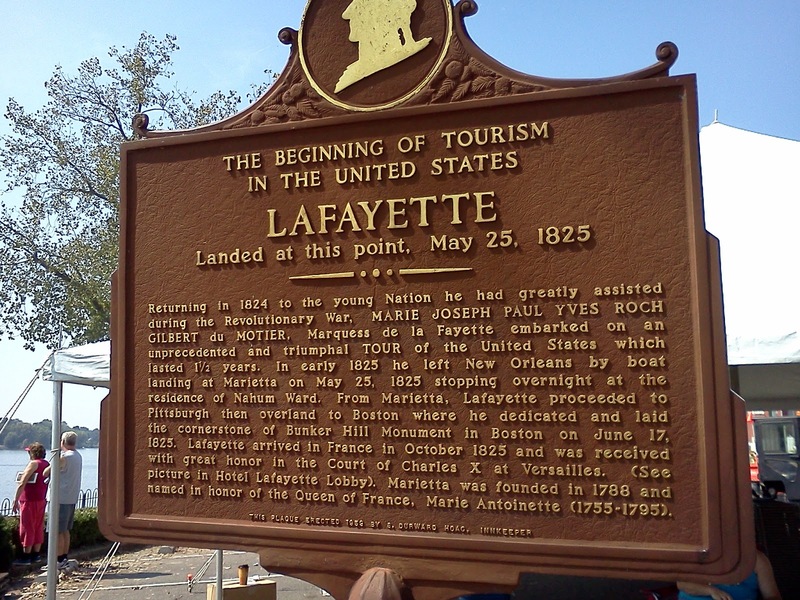 A monument at the river front showed that the town was founded in 1787, the first permanent settlement in what was then known as the Northwest Territory. It was a hot afternoon, but another fun show. We had a great sound company, and there were boats along the river behind us, with people enjoying the music along with the crowd assembled on the river bank. We had loud speakers facing out to the river so the people on their boats could hear the music. 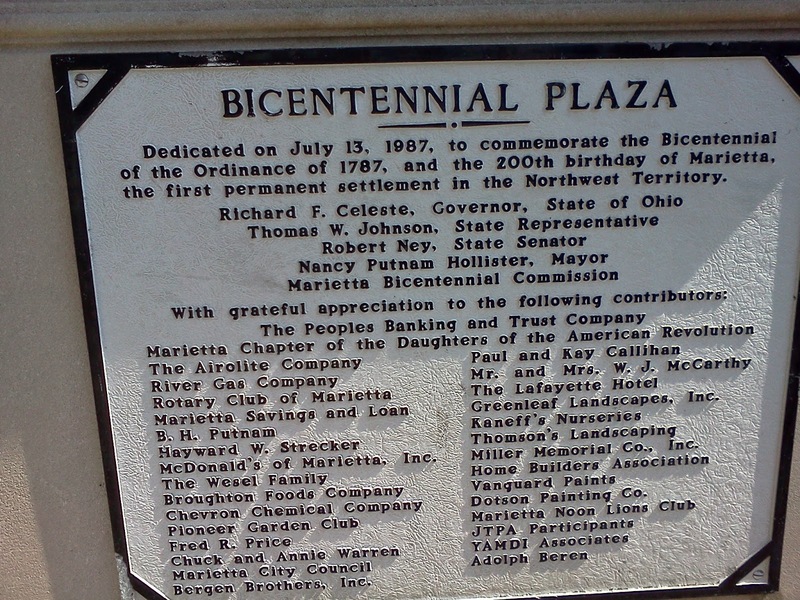 Marietta Ohio is right across the river from West Virginia. Since our gig ended at 4 pm, we figured we could make it back to Nashville that night. We packed up, with plenty of help from a stage crew that loaded our stuff into a pickup truck at the end of a ramp connected to the barge, which took it up the river bank to the van which was parked in the street in front of the Lafayette Hotel. We crossed the river into West Virginia, and came home that way, arriving by midnight.